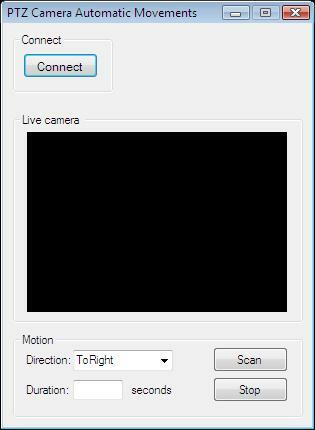 This example demonstrates how to implement automatic scan function into your PTZ camera application with motion control using C# language. With these features your application will be able to pan the environment automatically between two points, in left and right directions. To implement this example, you need to have OZEKI Camera SDK installed, and a reference to OzekiSDK.dll should be added to your Visual Studio project. The following methods can be used to scan automatically wtih your PTZ camera. These two methods provide the function to start and stop automatic movement at different patrolling durations. The following lines will show you a possible way to make your application to be able to scan automatically. With the presented method the camera can pan the area between two fix points. With the code below you can set the direction of the scan and start the automatic process that will operate the camera. Beside the described function you can also set how much time the camera should spend between the sides of the scanned area. Here is the code you can use to add these features. Why is the camera scanning, when I didn't order it?